Add a touch of elegance to your decor with this five light chandelier from the Château Vieux Collection. 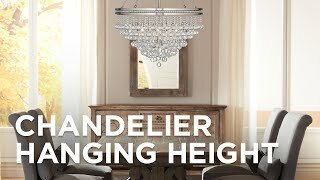 With its French style, this romantic Kathy Ireland brand, five-light chandelier blends Hollywood chic with European country style to make a beautiful statement. The visually appealing design features a swirl of thin wrought iron in an antique rubbed white finish. Strands of clear glass beads and crystal droplets provide lots of sparkle. From the Château Vieux Collection. 25 1/4" wide x 24" high. Canopy is 5 1/4" wide. Weighs 12.5 lbs. Uses five maximum 40 watt candelabra base bulbs (not included). Kathy Ireland Chateau Vieux 5 light crystal chandelier. Inspired by French country style. Antique rubbed white finish with crystal accent droplets and strands. I like it. Hopefully it will look good in the bedroom. Redoing room in French style. Good reviews. Liked photo. Love the French country with a little bling! What led light/wattage can I use in place of the 40 watt candelabra light? BEST ANSWER: I have added some LED bulbs below you may use (60 watt incandescent equivalency). Is that 40 watt LED light bulbs? BEST ANSWER: Hi - Yes, this is UL and CUL listed. Can this be used in a master bathroom with high ceilings? It would look great especially over the bath tub if you have one. It is a very elegant chandelier. I replaced all the glass with real crystal. Looks fabulous. It would be great in a bathroom with high ceilings. I would make sure you have enough chain to place it at the right height. Great light fixture. Yes, that would look fabulous! Thank you for your quick reply - I was concerned about whether or not condensation from the shower would be an issue. Can you use a dimmer switch on this? Yes absolutely. 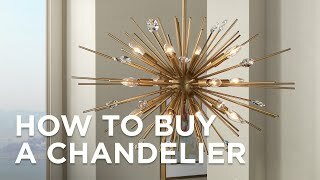 That is a must for chandeliers. Looks beautiful. Hi, does this light adapt to dimmers? I think so, but I can’t remember for sure. I do know it is beautiful. It’s perfect in my bedroom. Is the cord visible below the chain? Does it come with down rods? BEST ANSWER: No - the cord runs through the chandelier frame and suspended only by chain, not downrods. No to both questions. The cord goes down into a rod @ the end of the chain where the chandelier begins. Will this beautiful lighting go with a French dining room suit? It's brown. All chairs are Cain back with white seat covers. BEST ANSWER: This French country style chandelier would go very well with your dining room set. I think it would be lovely. My dining suite is brown with gray undertones and off white upholstery on the seats and backs. It really is a beautiful fixture. what kind of wiring does it have, can it plug into socket? BEST ANSWER: Hi, the chandelier gets hardwired to a power source of 110-120V AC; however, it can be converted to plug in. I want to use this is my country French bedroom. What kind of ceiling fan do u recommend for this and needs to be 42 or 44 inches. Or do u have other country French ceiling fans and lighting kits that’s the antique white with beautiful light kit with a dimmer. Then two bed side table lamps that would blend well??? 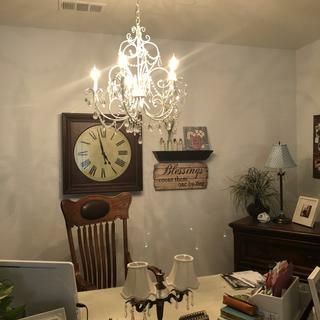 BEST ANSWER: I have included a ceiling fan that will coordinate well with this chandelier. Please feel free to contact one of our lighting specialists who can assist you with finding a ceiling fan that will best fit your design. Can this be on a dimmer? BEST ANSWER: Yes , this fixture can definitely be on a dimmer. I have mine dimmed all the time. Lovely. Yes, it can be on a dimmer. I actually have it on one and it works perfectly. Yes, I have mine on a dimmer. Is this a true white w/ black showing through or is the white creamy? BEST ANSWER: It's a creamy white. Not much black showing except along the lines where the metal parts are put together.. It really is a beautiful light. Would this look good hanging over a diningroom table? 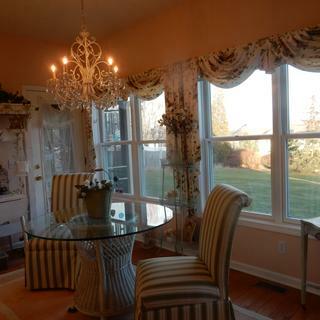 The chandelier is beautiful and depending on your decor would look very nice in the dining room. It is on the feminine side and we hung it in the master bedroom. Looks fabulous!! I put mine in my bedroom and it's gorgeous. You can put it over a dining room table. I think it would look good if the table is similar in style, ex French country. Do you think this will do well in a foyer stair well ? BEST ANSWER: Yes, This fixture would look lovely in a foyer. It is Traditional and quite delicate looking because of the light color. It makes a " quiet statement"
Yes! It's bright and beautiful. I have mine in the entry way/foyer. I love it!! Yes. Think it would be gorgeous if your style is shabby chic and/or cottage. 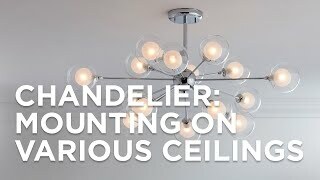 I ordered the chandelier ceiling fan kit but it is so small compared to the size of my bedroom, Can this chandelier be attached to a ceiling fan, say for instance #87534? BEST ANSWER: I'm sorry, the chandelier cannot be attached to a ceiling fan. In order for a light to be attached to a ceiling fan, it needs to be a light kit designed for that application. Please contact one of our lighting specialists via phone, email, or chat. They can assist you in selecting the best design for your lighting needs. Willthis be large enough for alivingroom..? BEST ANSWER: I have it in my dining room - 9 by 12. It might work in a room no more than 11 by 14. Any larger than that and I think it would look too small. It's gorgeous though. A lot prettier than the photograph. BEST ANSWER: Sorry, this is the only size we have of this chandelier. We hung this chandelier in my 9 year old daughters room. It looks great!! She has a high vaulted ceiling and large room. I was afraid it would be too small but turned out perfect. 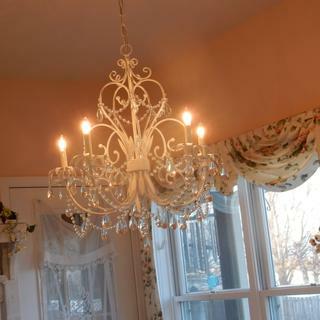 This is a great shabby chic chandelier and is perfect for any average/medium size dining room. I felt the construction was mediocre b/c the leaves are fragile, I didn't have any break off but I could see where some would if you are not careful. BUT if you hit this chandelier when its on sale you can't complain too much b/c the price is so great! I did a lot of shopping around before I purchased this and found it's almost impossible to find something this cute, at this size AND at this price. Overall I LOVE this cute chandelier! A beautiful chandelier for the money!!! My purchase with Lamps Plus was effortless and easy. My chandelier arrived very quickly. It is now hanging in my formal dining room and everyone who comes to dinner comments on how elegant and beautiful our chandelier is. The chandelier was, surprisingly, extremely affordable and looks even more expensive in person. The only thing that I would recommend if you are going to purchase this chandelier is to be careful with the leaves when taking it out of the packaging. They are fragile, and may need to be moved back into place after shipping. Otherwise, we are ecstatic about our purchase and look forward to our next purchase with Lamps Plus. 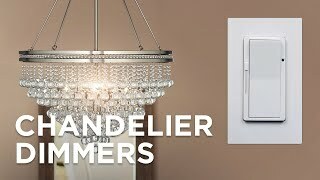 I use the lighting on a dimmer for a beautiful ambiance---it's very pretty!! It was packaged very well. Nothing was broken or missing. Love the way it looks. Tricky to install but once its up...great light source! Redoing dining room on a budget as husband recently retired. This fit the bill perfectly. It states wrought iron but is very lightweight and fragile. As others said be careful of bending the leaves. Some leaves actually show where the paint cracked but I am going for a mix of elegant and shabby and I think this chandelier is both. Mine looks more white than the ivory shown in the picture. I got it on a great sale. Some of the crystals I did not like and was missing the few to hang on the bottom beads but LP was great and sent those parts out immediately. I love it! I used this in the dining room that opens up into the kitchen (cabinets are dove white). So the feel for the decor is casual but elegant. 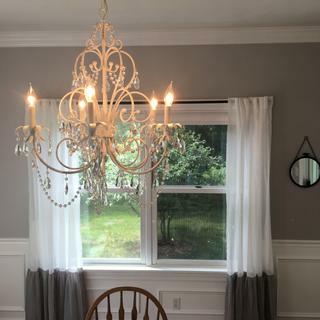 The actual color of the chandelier is more of a white that's worn over time. Definitely nice for shabby chic or French provincial. 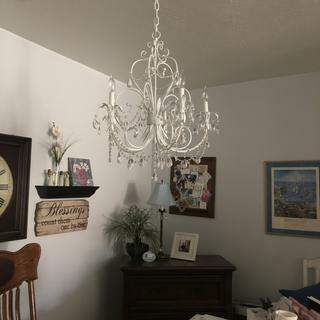 Fair chandelier for the price, other reviewers are correct about the leaves as they are quite fragile but none on mine were broken or looked bad. Overall, it's a beautiful statement piece. One strand on mine came broken and about 3 of the crystals were a little beat up, lamps plus sent replacements right away...loved their service. It's a keeper! 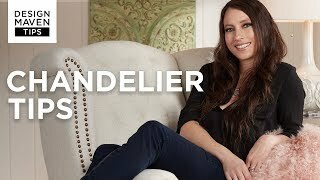 The is the perfect chandelier for my French Country Master Bath Retreat. It is beautifully elegant and makes an excellent statement. I installed it with a dimmer to utilize it for a variety of lighting needs. 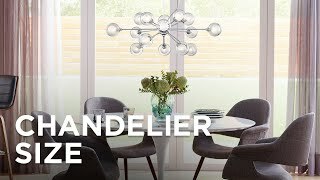 I installed this beautiful chandelier over my eat-in kitchen table & it looks gorgeous! I love the finish, beads and crystals! My kitchen is large and I wanted a fixture that would bring some elegance to the room. It dressed it up and provides excellent lighting (you'd want to consider a dimmer switch, for mood lighting). The metal leaves do bend easily and I hope they don't break; also, some of the beads hang unevenly and some of the crystals were missing, which I am waiting for the store to replace. Still, it is a FANTASTIC-looking chandelier for a terrific price! I was a little anxious about assembling the light once I read the reviews. Surprisingly it was not difficult at all. After opening the box,and removing the many crystals, my husband and I were ready to hang the light within forty five minutes. I recently had my kitchen remodeled, and my new cabinets are antique white with a mocha glaze. I am using a hint of shabby chic in the room and it is the perfect size for my medium sized kitchen. The construction and materials are not what you would get in a more expensive light, but for the price I think it is a bargain!! It arrived very quickly and was packed well. I love Lamps Plus for their fast delivery and the customer service is great. I have to admit when I first got it out of the box I was disappointed-it looked too small. Once I got all the crystals on it-it appeared larger. It is a medium sized chandelier--not for a big room. The style is VERY cute-- the crystals are not of the highest quality--some frostiness in them and just not the highest quality BUT it was only $400. so considering that it's nice. I do wish there were 'more crystals, but if you like a simple, clean, touch of class and crystals look, you will like it. It's very sparkly in the sunlight and the glass beads look like real crystals and are nicer than I thought they would be. All in all its a cute chandelier for the price. Very stylish french country look that is perfect for my bedrooom. Love this! It was missing a hook but it is so complex that you don't notice it. Great Addition to My Shabby Chic Decor! Delivery was prompt. There was a piece of crystal missing from the box, but Lamps Plus promptly sent me the missing piece. Their customer service was the best. This was my first time ordering and it was a great experience. Can't thank you enough. I will be a repeat customer! Thanks. Shipping and delivery were expedited very quickly and the product arrived sooner than expected. Love this very shabby sheik chandelier. It is in my daughter's bedroom & she loves it! Very decent lighting, not too bright though, and we added a dimmer switch for more ambient lighting. Only reason it didn't get a 5 is because my had a hard time hanging it. 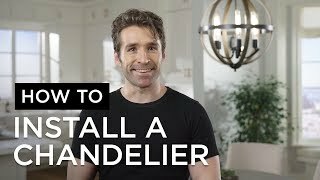 Although I love the look of this chandelier and found that the instructions were very easy to follow, it is very cheaply made. The leaves were all bent and I was terrified that in bending them back to where they belonged, I would break one. Crystals also are of a cheap quality and did not provide the prisim affect at night that I had anticipated. Color is a true white (but not bright white) with some distressing added to it. Overall despite everything I mentioned, I am happy with this chandelier as it is beautiful! Hi Cindy K., so sorry to hear that you had some issues with the hardware and crystals on your chandelier. We're glad you are enjoying this lovely design, but if you ever have any questions or concerns, please reach out to our customer service team via phone, email, or chat. Thank you. PRODUCT ARRIVED DAMAGED and company REFUSES help! 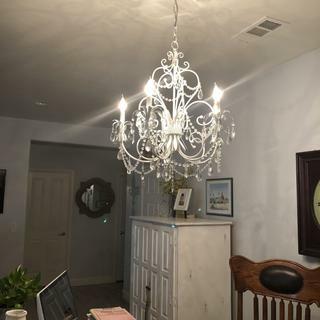 We bought this for expensive chandelier for our daughter's room We had to hire an electrician to hang and once hung we discovered the product and iron was clearly manufactured incorrectly. The crystals also unable to be all hung due to placement for them and the iron is totally crooked! After 3 WEEKS of emails and calls from us BOTH, the company refuses to reimburse us the electrician bill AND only ALLOWING us to return it! This is the WORST customer service we have ever encountered online! DO NOT order from Lamps Plus, you'll be SORRY if you do! Hi Robin W., thank you for your review. We sincerely apologize that you had issues with installing your fixture. We're sorry about the inconvenience, but unfortunately our customer service team is unable to reimburse an external company's installation costs. We offered a full refund and return covering the total of your order. We have made sure to forward your comments to our product team so they can look into it and correct if needed. If you have any further questions or concerns, please reach out to our team via phone, email, or chat. Thank you. This distressed two-tier chandelier features aged white candle sticks and a charming steel frame in distressed fenceboard wood finish. A gracefuldeluxe look from Kathy Irelandthis pendant features richly detailed champagne glass and a nuanced golden bronze finish.